CCTV Camera Pros is a direct supplier of BNC monitors with LCD and LED display used for live security camera video display. Our CCTV monitors have a BNC input connector and a BNC loop output. A BNC monitor is commonly used in CCTV installations to display video output from surveillance DVRs, video multiplexers, color quad processors, and directly displays from CCTV cameras. Because our CCTV monitors have a BNC loop out, installers can connect a camera directly to the input of the monitor, then use the loop output to run the video signal back to a DVR. This is very handy in cases where you want to mount a live display spot monitor close to the camera and also want the video signal to feed a DVR or other device. This type of application is typically seen in department store entrances and public building entrances so that customers are aware that the area is under video surveillance. Our BNC monitors are compatible with both NTSC and PAL video standards. The BNC inputs on the monitor detect the video standard of the input device and automatically switch to NTSC or PAL. The above image shows how-to connect a CCTV camera directly to the HD BNC input on one of our BNC monitors. One of these RG59 coax patch cables is being used. You can also use RG59 Siamese cable if you want to run both the video and power to the camera from the monitor location. There is another BNC connection to the right of the input that the camera is connected to. This is the BNC loop output. It can be used to send the video signal of the camera to another device, such as a video surveillance DVR. Here is a diagram that shows how to install a live security monitor with a surveillance DVR is done. The orange and green cable is RG59 coax. The BNC output of the CCTV camera connects to the BNC input of the monitor. The BNC loop output of the monitor connects to one of the BNC inputs on the DVR. Please note that the camera, monitor, and DVR can be very far apart. Also, you can still use the HDMI or VGA video outputs of the DVR to have a display monitor to control the DVR. 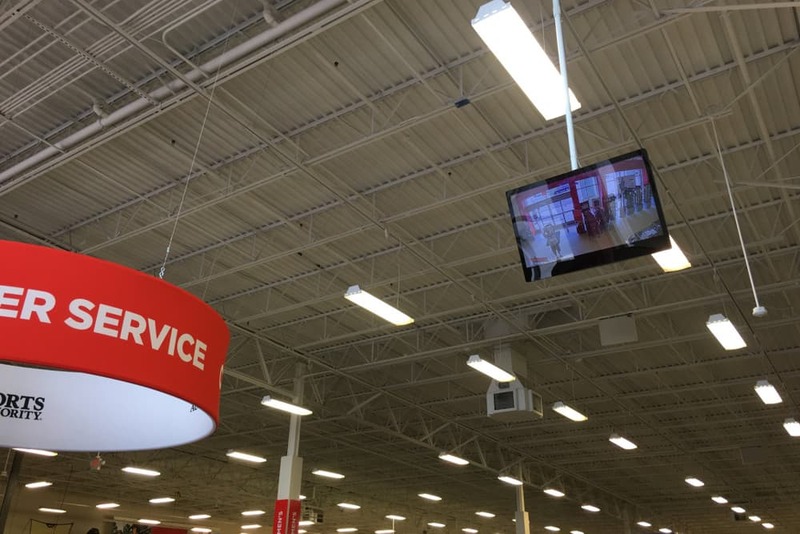 Here is an example of a 22" CCTV monitor being used as a public live video display monitor in a retail store. In this installation, an analog CCTV camera is wired to one of the BNC video inputs on the monitor and the BNC loop output is wired to a surveillance DVR. This allows the camera's video to be displayed live to customers at the store entrance and also be recorded on the store's central DVR. RG59 coax cable is used for all wiring. Here is a close-up of the video inputs / outputs and audio inputs / outputs that are available on all of the BNC monitors that CCTV Camera Pros supplies. An infrared wireless remote control is included with some of our BNC monitors. Please check the spec for the model that you are interested in. The wireless remote can be used to power the monitor on/off, change the video input, mute sound, freeze the screen, and access the settings menu.